ʻUluʻulu and CLEAR staff came out to thank Marcia Mau and Frank Moy for their gift. Seated to Moy’s right is Barbara Kawakami and her daughter, Fay Toyama. An effort to digitize, preserve and catalog the plantation history collection of Rice & Roses, a long-running public television series, received a boost last week, thanks to a generous donation from a Northern Virginia couple who visit the state each year. The gift will allow the Center for Labor Education and Research (CLEAR) and ʻUluʻulu: The Henry Kuʻualoha Giugni Moving Image Archive of Hawaiʻi to continue working to preserve the programs and production material from Rice & Roses. The series focuses on plantation and labor history and is produced by CLEAR, which is located at the University of Hawaiʻi-West Oʻahu. The couple, Frank Moy and Marcia Mau, were recently hosted by CLEAR. They highlighted the importance of preserving and making available the collection to a new generation of users who can access clips on the Internet. Moy and Mau have donated a total of $32,000 to the effort. “I see it visually as treasures that are trapped in these tapes,” said Moy during his visit. 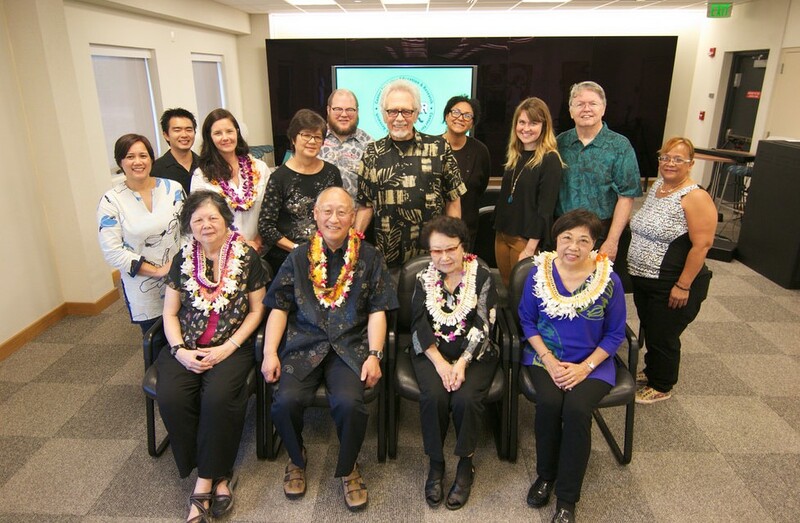 Moy and Mau’s initial gift to the University of Hawaiʻi Foundation last year resulted in the digitization of 156 videotapes with 54 hours of footage, scanning of 82 interview transcripts, and making 23 video clips available online. Last week the couple funded more of the work, which can also be used to create curriculum, or make YouTube videos that showcase Hawaiʻi’s history and culture for a general audience. Much of the material being preserved has never been used for broadcast and presents a unique workplace perspective on Hawaiʻi history. Moy, a retired engineer, and Mau, who was born in Honolulu and worked for the Federal Deposit Insurance Corp. in Washington, D.C., believe in the importance of the work. Moy said he believed it was vital to preserve and bring to life the stories captured on videotape, but not widely accessible in a digital age. Many of the Rice & Roses interviews were conducted with the help of historian and author Barbara Kawakami, who worked with Rice & Roses on a series of programs on plantation life and befriended Moy and Mau after the release of her book, Japanese Immigrant Clothing in Hawaiʻi 1885-1941. This ultimately led to a meeting with Chris Conybeare, a CLEAR specialist who took over Rice & Roses as producer/writer/host in 1981, and Joy Chong-Stannard, a noted local producer-director, after Kawakami published her second book, Picture Bride Stories, in 2016. The collaboration between CLEAR and ʻUluʻulu has resulted in clips that are placed on the ʻUluʻulu site, including a collection of interviews and other previously unseen production footage with titles such as Maids, and Picture Brides. Other work is being done to produce vignettes from Rice & Roses footage, such as a piece featuring an elderly woman who proclaims rice tastes best cooked over a flame, which she demonstrates outside of her plantation home. The piece was assembled from footage shot in 1987 as Kawakami interviewed the woman, who had come to Hawaiʻi as a bride in 1926, and discussed what life was like in a plantation camp. The piece also shows how different life was for immigrant sugar cane workers, including footage of an outhouse and a demonstration of how water was heated for a furo (a short, deep Japanese tub). Moy noted the interview was important too because it was conducted in Japanese, and that the dialect spoken may no longer exist. The number of Rice & Roses clips being made available on ʻUluʻulu’s site is growing, said Janel Quirante, ʻUluʻulu head archivist, who noted the work is much more painstaking than simply running a tape through a machine that digitizes the footage. Some tapes need more cleaning than others. Three files are created for each tape that is digitized–one for preservation, another of intermediate quality, and a third low-resolution version that can be viewed online. Cataloging also is important so the material can be searched, which contributes to one ofʻUluʻulu’s goals, which is preserving and saving the state’s cultural heritage. Conybeare said that obtaining access to the content of these tapes is of particular importance, since 2018 represents the 150th anniversary of Japanese immigration to Hawaiʻi. He observed that even with the work that has been done, another 1,800 to 2,000 Rice & Roses tapes need to be preserved, digitized, and made accessible. Tagged Barbara Kawakami, Center for Labor Education and Research, Frank Moy, Hawaii culture, Hawaii history, ʻUluʻulu: The Henry Kuʻualoha Giugni Moving Image Archive of Hawaiʻi, Marcia Mau, plantation life, Rice & Roses, University of Hawaii West Oahu. Bookmark the permalink.